Mayor John G. Ducey is proud to announce the promotion of Brick Township Lieutenant David Forrester to the rank of Captain, Sergeant Henry Drew to the rank of Lieutenant and Patrolman Austin Kenny to the rank of Sergeant. Mayor Ducey administered the oath of their ranks at the December 5 Council meeting. Captain David Forrester has been a member of the BTPD since February 1996. Captain Forrester has served in several capacities during his service. He has served in the patrol division, on the SERT Team, Detective Bureau, as a school resource officer, in the Professional Standards Unit and Internal Affairs, among others. Captain Forrester is a 1991 graduate of Brick Township High School. He is a 1997 graduate of the Richard Stockton College of New Jersey and earned his Master’s Degree in Administrative Science from Fairleigh Dickinson University. Captain Forrester also retired as a Major from the New Jersey Air National Guard after 24 years of service. Captain Forrester has been assigned to the Community Policing Division as the Division Commander. Lieutenant Henry Drew has been a member of the BTPD since January 1995. He is a 1989 graduate of Brick Memorial High School and a 1993 graduate of Kean College. Lt. Drew began his career in the Operations Division. He served on the Ocean County Narcotics Strike Force from 2004 – 2006 and was in the BTPD Drug Enforcement Unit. He was promoted to the rank of Sergeant in October 2007. He has served in the Community Policing and Investigations Divisions. 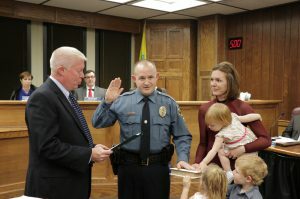 Sergeant Austin Kenny has been a member of the BTPD since August 2005. He is a 2003 graduate of Brick Memorial High School. Prior to joining the BTPD, he worked as a Special Police Officer in Point Pleasant Beach from 2003-2005. Sergeant Kenny has served as a Field Training Officer, on the BTPD Marine Unit and Honor Guard. Sgt. Kenny attended the first BTPD Police Camp in 1997 and served as a member of the Brick Police Explorers from 1999 – 2003. 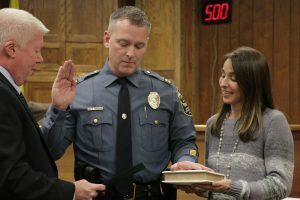 The promotions were necessitated by the retirement of BTPD Captain Timothy Boyle who retired December 1 after twenty-four years of service and were done in accordance with civil service requirements. 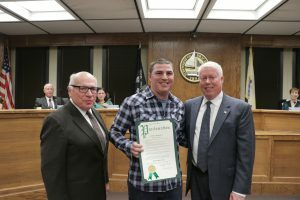 Mayor John Ducey and the Township Council honored the Brick Township Police Department on receiving the 2017 New Jersey EMS Award for the town’s Blue HART Program at the December 5 Council Meeting. The award was given during the New Jersey Statewide Conference on EMS in November. The Blue HART (Heroin Addiction Recovery and Treatment) Program was started in January. 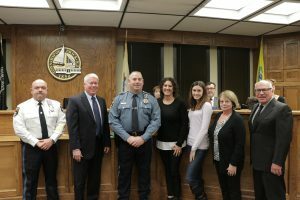 Through this program, addicts and substance abusers who want help can present themselves at the Brick Township Police Department where they will be transported to a treatment evaluation facility without the threat of charges or incarceration. Since the program began, over 200 addicts have been placed into treatment. Reinstatement of BMAC (Brick Municipal Anti-Drug Coalition) and it has focused on educating the community about opioids. Aggressive campaign to encourage and educate about the proper disposal of unused or unwanted prescription drugs. Creation of an ordinance that holds landlords responsible for repeated criminal behavior of tenants. Hiring a retired police officer to address code enforcement issues in problem areas of town. According to the Brick Township Police Department, the township has seen a significant reduction in overdoses and deaths this year. If you or a loved one is struggling with opioid or heroin addiction and would like to seek help through the HARP Program, visit the Brick Township Police Department on any Thursday. There is no fee for people who seek help through the HARP Program. Any citizen interested on serving as a member on one of the township’s various boards or committees should send an email with a resume and cover letter to Mayor John Ducey before or on Thursday, December 14. Brick Township Housing Authority – The Brick Housing Authority administers both a public housing and Section 8 housing voucher program. Sustainable Brick – works with the township staff to create and support policies, events and activities that support and encourage sustainability. Ethics Committee – receives and reviews ethical questions or complaints alleging that the conduct of any local government officer or employee serving the municipality is in conflict with the Code of Conduct, or applicable ethical standard. Brick Township Municipal Utilities Authority – The BTMUA is responsible for delivering clean, safe potable water and reliable sewage collection services to customers. “Anyone interested in serving should send their resume with a cover letter by December 14 to make sure they are considered,” said Mayor Ducey. Resumes and cover letters should be emailed to mayor@twp.brick.nj.us no later than 5pm on December 14. While efforts will be made to place citizens on requested boards, it will not be possible in all instances due to availability. Mayor John G. Ducey is proud to announce that his Facebook Live initiative was awarded the Best Special/Innovative Media Award in the 2017 Municipal Public Information Contest sponsored by the New Jersey State League of Municipalities, Rutgers Center for Government Services and the New Jersey Municipal Management Association. The award was given at the New Jersey League of Municipalities Conference in Atlantic City. Mayor John G. Ducey accepts the award at the NJ League of Municipalities Conference in Atlantic City. 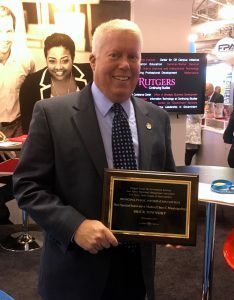 Brick Township’s award was for Class C Municipalities, which for the purpose of the contest are the 130 municipalities with more than 20,000 residents. Facebook Live is a free live-streaming service offered by Facebook. It allows users to live-stream content. Mayor Ducey began using Facebook Live in December 2016 and since then has hosted 20 sessions. During each session, Mayor Ducey answers questions submitted during the broadcast by viewers. “I would like to thank all the residents who watch the Facebook Live and ask questions. These sessions don’t work without you,” said Mayor Ducey. Each session is archived and available for viewing on-demand. The videos of the sessions have been viewed over 59,000 times cumulatively. This is the third time in four years that Brick Township has been named an award recipient in the contest. In 2014, the Township won the Best Special/Innovative Award for Talking Brick with Mayor Ducey and in 2016 the Township was awarded Best Web/Social Media. The next Facebook Live with Mayor Ducey session will take place on Tuesday, November 21 at 11am. You do not have to be a Facebook user to watch however, if you would like to ask a question, you do have to be a registered Facebook user. Visit Brick Township’s Facebook page at www.facebook.com/BrickTwpNJGovernment to learn more or to view past sessions. Brick Township Councilwoman Marianna Pontoriero was awarded the Patient Courage Award by the Mayors Committee on Life Sciences at the Monday, November 13 Council Meeting. Councilwoman Marianna Pontoriero addresses the audience at the November 13 Council meeting. The Patient Courage Award is presented to remarkable individuals who have triumphed over adversity despite difficulties due to a serious or chronic disease. 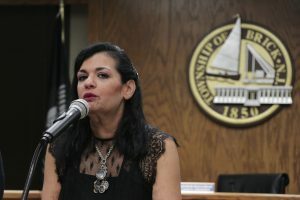 Councilwoman Pontoriero was diagnosed with oral cavity cancer – a rare and debilitating form of head and neck cancer – in February 2017. She has continued to serve the public while battling the cancer. Marianna Pontoriero, who is an attorney, has served on the Township Council since January 2014. On November 7, she easily won re-election and received the most votes on any council candidate on the ballot. In addition to her serving on the Council, Marianna is active in several charitable organizations including Ocean Harbor House, where she serves on the Board of Directors. Marianna and her wife Crystal have been foster parents for over 10 years and have three young children. 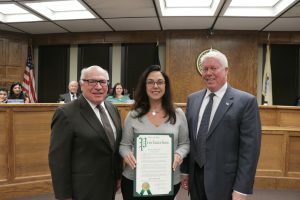 Mayor Ducey honored Councilwoman Pontoriero at the meeting with a Mayoral proclamation designating Friday, November 17 as Councilwoman Marianna Pontoriero Day in the Township of Brick. Mayor John G. Ducey honored Municipal Engineer Elissa Commins and Engineering Division employee Russell Harris for their recently being named recipients of awards from the New Jersey Association of Floodplain Managers. Mayor Ducey honored them at the November 13, 2017 Council Meeting and proclaimed a day in each of their honor. Elissa Commins received the organization’s 2017 Floodplain Management Leadership Award and Russell Harris was named recipient of their 2017 Outstanding Local Floodplain Management Official Award. Elissa Commins (center) receives her proclamation from Mayor Ducey (r) and is joined by Council President Art Halloran. Elissa and Russell were both instrumental in the township’s acceptance into the National Flood Insurance Program’s Community Rating System. The National Flood Insurance Program Community Rating System was implemented in 1990 as a voluntary program for recognizing and encouraging community floodplain management activities exceeding the minimizing NFIP standards. Under the CRS, flood insurance premiums rates are discounted to required community actions that reduce flood damage to insurable properties, strengthen and support the insurance aspects of the NFIP and encourage a comprehensive approach to floodplain management. Russell Harris (center) with his Mayoral Proclamation. As part the township’s efforts to get accepted into the CRS, the Engineer Department staff – led by Elissa and Russell – contacted the owners of 665 non-compliant structures in Brick Township, hosted workshops to provide assistance on mitigation of non-compliant structures, and conducted field inspections to encourage compliance as required in order for the Township to be eligible for the Program. Acceptance into the CRS means that residents who have to pay flood insurance will see discounts on their premiums. The cumulative savings is $657,914 with an average of $200 per policy. In honor of their awards and in recognition of their dedication and exemplary work, Mayor Ducey proclaimed November 14, 2017 as Elissa Commins Day and November 15, 2017 as Russell Harris Day in the Township of Brick. 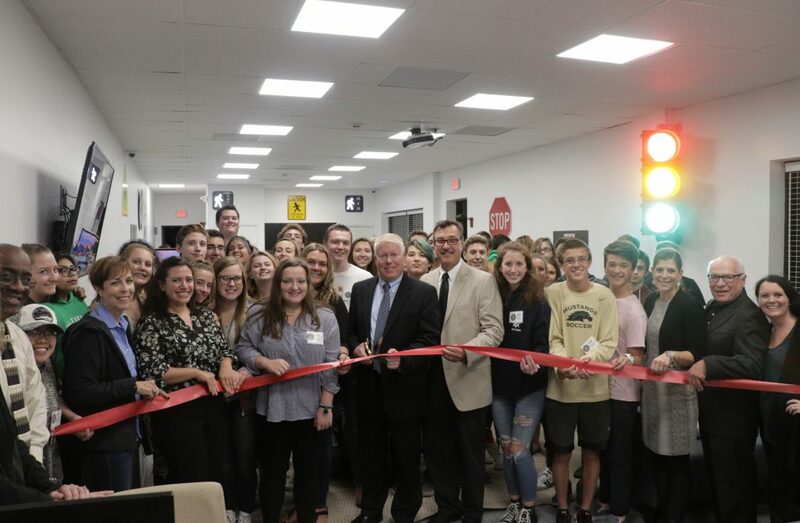 Mayor John G. Ducey will be joined by Township Council members, township officials and community members at the ribbon cutting of the Lounge 270 Teen Center in the Brick Township Civic Plaza on Thursday, November 2. Lounge 270 is the first municipally-run teen facility in Brick Township’s history. The teen center will be open on Thursdays from 2pm – 10pm and there is no admission fee. The lounge will be staffed by Recreation Staff members during these regular hours. The lounge has furniture, computers, televisions, video game systems and more. Mayor Ducey has sought input from young people through his Brick Youth initiative on what they wanted the lounge to be. Lounge 270 was funded through a $20,000 grant awarded by the Ocean Partnership for Children. Councilwoman Andrea Zapcic and Township Assistant Planner Tara Paxton were instrumental in the township’s receiving the grant. Any young person wishing to visit Lounge 270 will be given a free membership card. The card will be scanned upon entering and leaving the lounge. Membership cards will be available at the lounge and at the Brick Township Recreation Department. Anyone who wishes to follow what’s happening at Lounge 270 and other news, events and programs for young people can follow the Brick Youth Facebook page (www.facebook.com/BrickYouth). Mayor Ducey, Council Members and citizens cutting the ribbon! On Thursday, November 2, Mayor John G. Ducey, Township Council members and community members cut the ribbon to the renovated Hank Waltonowski Park and officially opened the park to the public. It was the fifth park improvement project completed during Mayor Ducey’s term. The Hank Waltonowski Park is located on Ashwood Road in the Birchwood Park residential development. The improved park includes two (2) basketball courts, a playground for ages 2-5, a playground for ages 5-12, a softball/baseball field, a gazebo and a walking trail. The park also has landscaping, benches, a retention basin and a bicycle rack. The entire park is ADA-compliant. The cost of the renovation is $1,228,513. The winning bid was submitted by Precise Construction of Freehold. Precise Construction previously completed the Herberstville and Angela Hibbard Park renovations. CME Associates designed the park and are serving as the consulting engineers on the project. The Township has applied for Green Acres funding to offset the cost of this and other park projects. 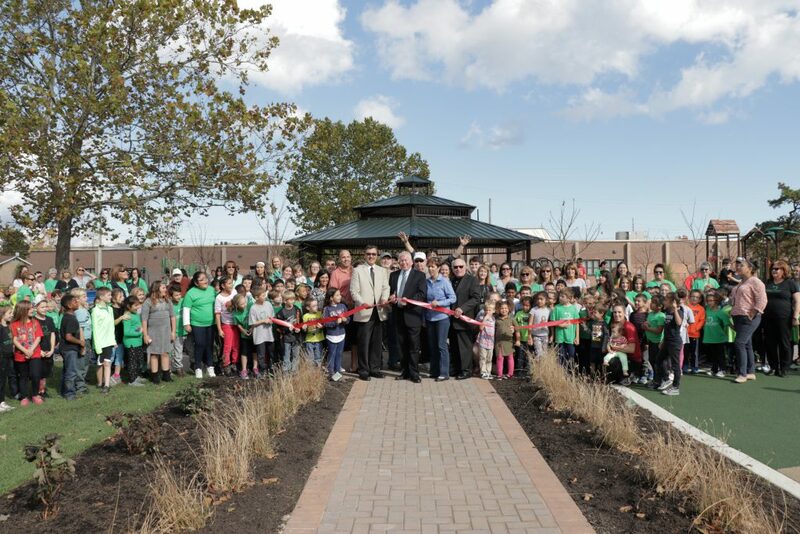 The park was named in memory of Hank Waltonowski, a Brick Township Public Works employee who was killed in a work accident in 1996. The next park scheduled to be improved is the Bernard J. Cooke Park in the Parkway Pines residential area. The renovation of Bayside and Cedar Bridge Manor parks are expected to follow. Previous renovation projects during Mayor Ducey’s term include the Windward Beach playgrounds, Herbertsville Park (formerly Colorado Park), Lake Riviera Park and Angela Hibbard Park. Mayor John Ducey announced that the Township will be filing a lawsuit against opioid manufacturers, based on the companies’ misrepresentations to medical providers and patients of the dangers of opioid painkillers. The Mayor has engaged the national law firm of Motley Rice, LLC to represent the Township in the lawsuit. Under the terms of the agreement, the law firm will not receive any payment from the Township but will instead take a percentage of any recovery from the drug manufacturers. The Township Council is expected to approve the agreement at its meeting on Tuesday. Ducey noted that drug overdoses in Brick have steadily increased, from 69 in 2014 to 212 in 2016. The number of overdoses so far this year is 92, which is significantly down from this same time last year. This is a direct result of the Police Department’s efforts on education, enforcement and rehabilitation through the Blue HARP (Heroin Addiction Response Program). The police have set up a drug enforcement unit to pursue dealers, while a community policing unit educates children and the public about the dangers of opioid use.